After his second preseason game with the Boston Celtics in 2017, Kyrie Irving walked off the court in Philadelphia and noticed a young fan along the sideline wearing his old No. 2 Cleveland Cavaliers jersey. On a whim, Irving kicked off his Nike Kyrie 3 signature sneakers and passed them to the beaming boy. "Can you sign them?" the young fan asked as he pulled a Sharpie out of his pocket. "You're my favorite basketball player! I've got your jersey and everything, bro." "I got you, bro," Irving said. 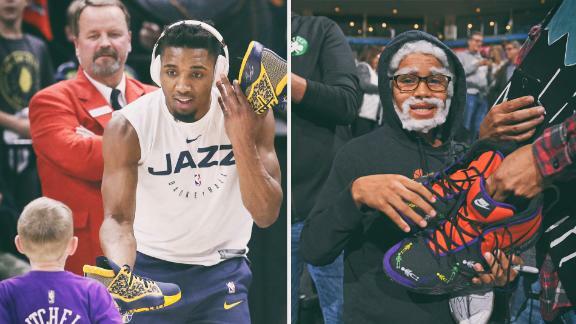 Just like that, the latest NBA trend was born: the league's biggest stars signing and giving away their game-worn sneakers to fans. The 25-second clip on the league's official Twitter account garnered 960,000 views, nearly 8,000 retweets and became an instant example of how personable players could be in just a sliver of time with their youngest, biggest supporters around the country. "These are all impromptu moments," said Bob Carney, the NBA's VP of Social & Digital Content. "A lot of the moments that we've captured, the players would have no idea necessarily that they're being filmed. That's what makes some of these moments so special, because they're so raw and authentic." A few nights later, after Irving's fourth preseason game, the newly acquired franchise point guard spotted a fan in his new Celtics jersey opposite the team's bench in Charlotte, North Carolina. Irving raced across the court in his socks after the final buzzer to hand off his pair of Kyrie 3s from the night's victory. Ever since, some of the league's biggest names have joined in on the tradition, including Stephen Curry, LeBron James, Russell Westbrook and Donovan Mitchell. Only seventeen of the NBA's 450 players have their own signature shoe, making the gesture rarified air for young fans while providing an additional spotlight for their All-Star idols' latest sneakers across social media. After road wins -- particularly during blowouts, when the starters have been pulled and have had time to relax along the bench -- Irving, Curry and Westbrook can be seen peering through the crowds in the closing seconds, looking for young fans wearing their jerseys. One of Curry's first sneaker giveaways was in Orlando, Florida, in early 2016, after he spotted a fan and his two handwritten signs late in the game. The white poster board etched with blue and yellow marker made mention that not only was it the fan's birthday, but he had saved up $400 to buy tickets to see Curry play during the Warriors' lone visit to Florida that season. After a 51-point outburst that ranks tied for his third-highest scoring game, Curry took off his white and blue Under Armour Curry 2s and instructed the team's security guard to pass them along to the young fan. Now, Curry personally walks over to hand off the shoes, often working with the team's security to first pull the pre-selected fan over along the baseline. Unlike most players, Curry leans down and signs the toe cap of each shoe while they're still laced and on his feet. He ramped up his giveaways late last season and into the fall with the Curry 5, with even more frequent freebies for his game-used Curry 6 model this year. That's been by design, as the Warriors are set to move across the bay to San Francisco after this season, closing the book on their 47-year tenure in Oakland, California. His newest Under Armour shoe features a season-long theme of "10 In The Town," celebrating his 10 seasons with the franchise in Oakland. He's made a point all season to find fans in road arenas for giveaways, while also making sure he can give away pairs at Oracle Arena to the loyal home fans who have followed his rise. "The atmosphere at Oracle is so unique," Curry said. "From my first season in the league, we didn't sell out crazy, but there was a different energy. They're like true basketball fans that are really into the game, they actually watch the game and they flow with the emotions, the momentum and the runs of the game. It's always been like that." While Curry and Irving have been consistent in their giveaways all season, James' lone handoff this season touched a longtime fan of his more than he could imagine. In early December, the Lakers were enjoying a convincing 111-88 win at Memphis, with time still on the clock when James caught the attention of the Grizzlies' 23-year-old assistant equipment manager, Brian Miller. "Every year I've come here, she's always worn a very exclusive pair of my shoes, and I've always noticed it, but never said anything to her," James said after the game. As he unlaced his one-of-one, size-16 purple pair of LeBron 16s while seated on the bench, he stood up and motioned for Miller to come over and get the shoes. "You're a hard worker and I appreciate you," James told her. She instantly broke down in tears, gripping the sneakers with all her might after getting a hug from James and the Lakers' security guard. James posted the video on his Instagram page, where it received 7.2 million views and 11,936 comments. "It was a dream come true," Miller told The Undefeated. "An amazing moment." She reportedly passed on a $100,000 offer for the LeBron 16s, saying she was "loyal to the max." "She was like, 'Yeah ... I've always been Team LeBron. Always,'" James said. "So, she got a pair of LeBrons." Her Instagram bio now reads: "12/8/2018 Changed my life forever "
While most players have taken to giving away their pairs after victories, when they're presumably in a good and giving mood, Mitchell has taken a different approach all season long. He'll break out a new size-15 pair of the Adidas Pro Bounce Low or the Adidas Pro Vision for his sweat-drenched pregame workout, then find an early-arriving fan for a more intimate sit-down and handoff. The pregame approach has in theory led to even more giveaway pairs for Mitchell, whose Utah Jazz are currently eighth in the combative Western Conference, having hovered above .500 for most of the season. The pregame moment also allows for Mitchell to take more time with his autograph, and pose for pictures and videos with fans. Recently, that included 102-year-old Roberta Morgan, a lifelong Jazz fan. While she never misses a game on TV, she'd never before attended one in person. When Mitchell heard the team would be hosting Morgan courtside for an upcoming game, clad in her own custom No. 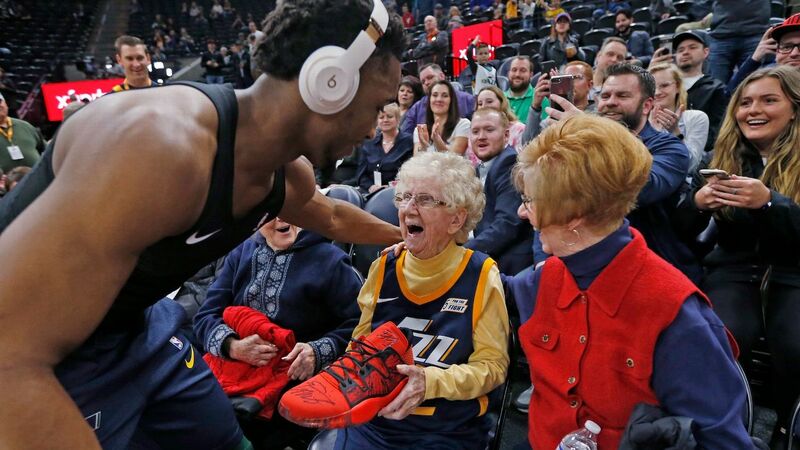 102 Jazz jersey, he arranged for another pregame sneaker drop-off, signing his red Pro Vision PE along the toe cap before giving them to Morgan. She instantly held the shoes up like she was hoisting the Larry O'Brien Trophy in June. Like the other players, Mitchell is no stranger to the full spectrum of reactions that the spontaneous interactions can cause. His pink and neon pair of the Pro Visions elicited raw joy and disbelief from two girls courtside. There was also the young boy who figured the size-15 sleds were most definitely not his size -- so he initially declined Mitchell's offer. Then there's Westbrook. One of the league's more polarizing road personalities when dealing with adults, he visibly took the brunt of a heckler's wrath earlier this week in Utah, lashing out in response. Conversely, Westbrook is all smiles when it comes to kids, as his eyes will often dart from end line to end line late in games, searching for his familiar No. 0 Thunder uniform. His giveaway approach, much like the design of his Jordan WhyNot Zer0 signature sneakers and his noted approach to fashion, is purposefully all over the place. Some games he'll slowly walk toward a kid, hand over his sneakers and give a playful nudge and hair rub. "For me, I'm assuming it's got to be just a blessing, just for me to have my own shoe to give to a kid," Westbrook said. Other games, Westbrook has tossed his full pair at an OKC-uni-clad fan, then immediately sprinted off, cackling through the exit tunnel's darkness and off to the locker room. Kids now have no idea what to expect. "Sometimes, I wait to see their reaction," he said. "But a lot of times, I give them the shoe and run back and then people come to me afterward -- 'You should have seen his or her reaction.' It's usually a shock reaction of the kid and it's always good." More memorably, Westbrook offered up a sideline blockbuster trade to a blond boy named Harrison before his pregame warmup: Your slice of pizza for my Jordans. Harrison took the exclusive black, orange and cement print WhyNot Zer0.1s, pulled back his pizza, smiled and walked off. "He decided to keep it," Westbrook said with a laugh after the game. "I actually came out on the very low end of the trade." For the handful of players who have taken to giving away their sneakers on a game-by-game basis, the practice has become a perfect storm of made-for-social media viewing, visibility for their sneaker lines, and most important, a touchpoint with the league's most frenzied fans. "I think it's important," Westbrook said on "The Tonight Show." "The kids get to come to the game and get an opportunity to meet guys like myself and I find out ways to interact with them -- jersey, autograph, my shoes. I've been giving out my shoes every game to a fan or whoever it may be." Westbrook has said that he attended only one NBA game during his childhood. Like the other handful of players in on the current sneaker giveaway trend, he wants to make the most of his status in the league now that he's on the other side. "Obviously, I'm not going to be able to give every kid a shoe," he said. "But if I could, I would." From LeBron James to Russell Westbrook, many of the league's top players have rewarded fans with fresh kicks this season. 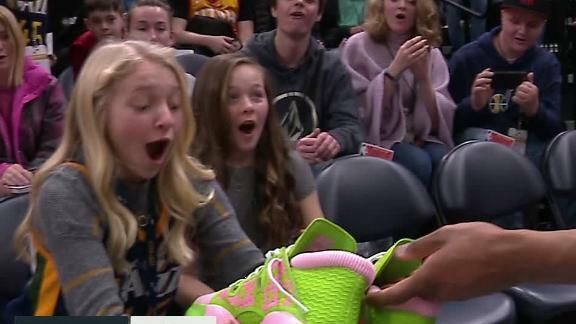 Donovan Mitchell signs his shoes and gives them to two young girls in the stands. 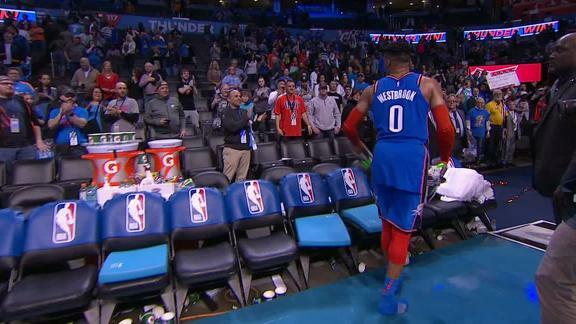 After the Thunder beat the Nets, Russell Westbrook gives away his sneakers to a pair of lucky fans.